Even if your team uses Max/Maya, this may still be relevant if you’re interested in offering mod support because the majority of your community will be using Blender. By pressing Ctrl+U you can save a default file setup to use when opening Blender. These options will help with creating UE4 content. 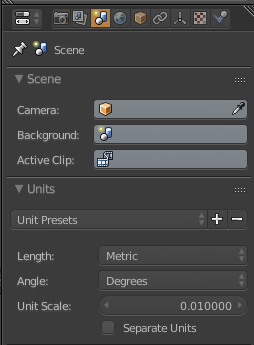 UE4 uses centimeters, so change your scene units to Metric with a Unit Scale of 0.01. I’ve included this in the default scene because most models have LODs, so in the rare case they don’t it’s easily deleted. Version: Binary – fbx_type custom property was only recently added to the official Blender version, and is only supported in the binary exporter. Smoothing: Face and Tangent Space: True – Properly import smoothing and normals into UE4. Only Deform Bones: True – Personally I turn this on because I don’t need any control bones in the game, but if you use them for runtime IK or something this should be False. Add Leaf Bones: False – Epic’s official skeletons don’t have leaf bones, and they clutter up the skeleton view. Primary Bone Axis: X Axis and Secondary Bone Axis: -Z Axis – Matches Epic’s official skeleton bone orientations, but is not a big deal. These changes require a source build of UE4. Your mileage may vary, but this has been working fine for me. You may want to search for an _LOD# suffix instead, but I opted for the existing FindChild function.